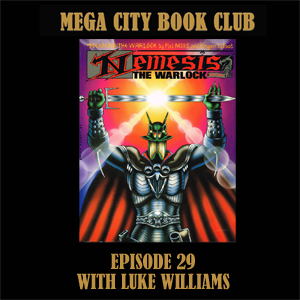 Luke Williams, who posts as Seth73 on the ECBT2000AD blog, is my guest to discuss book 4 of Nemesis the Warlock by Pat Mills, Kevin O'Neill and Bryan Talbot, with some pretty big spoilers along the way. Check out Luke's potted histories of key 2000AD characters on the ECBT site. And buy your copy of the complete Nemesis the Warlock voulme 1 from the 2000AD online store. 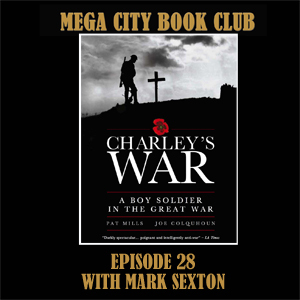 Art droid Mark Sexton joins me in that London pub to discuss one of the absolute classics of British comics history, Charley's War by Pat Mills and Joe Colquhoun. You can find a full listing of Mark's comics work on is ComicBookDB page. Charley's War is available in ten lovely hardbacks from Titan books.